When I was in my early teens I read Albert Camus' The Stranger - L'Étranger - for the first time. My crazy Uncle Mike tossed it across the table to me. Heck, why not? As I recall the novel opens as the "hero" attends his mother's funeral and everyone is put off by the guy because he isn't crying and moaning and upset. He's just flat - no affect. When two Algerian guys are later murdered he somehow gets framed for the crime and, because he's so unemotional he is, by the end, found guilty and hanged. What kind of man doesn't cry at his own mother's funeral? He must be guilty because he's obviously callous. But this fellow is not that upset by everything that happens. The last scene finds him in his cell awaiting execution and wondering why he isn't outraged. This must be the original "whatever" novel. But maybe I'm misreading it, or my memory is hazy. One must be more conventional, I suppose. I often wonder why I just feel numb at events where others are really overtly happy, or weeping and wailing. I'm quiet, watching. I am, after all, Slovak-American, not French-Algerian like Camus. I should feel something. Well, I do. I'm just not very demonstrative, I suppose. This brought to mind Woody Allen's film Annie Hall. This is pretty much a film about trying to tune your emotional response, your affect, to what is appropriate. The whole film is about one fellow's problems with that - except it's played for laughs in the film. It's a lot funnier than the Camus novel. No kidding. Woody Allen favored Anhedonia as the title for this production, and it was changed only three weeks before it's first screening at the Los Angeles Film Festival, Filmex, in March 1977. Co-screenwriter Marshall Brickman had other ideas for the title - It Had to Be Jew and, Me and My Goy. Obviously United Artists had to step in before the release. Allen it seems was determined to have his way, but at test screenings he did allow different titles to be tried out. Anhedonia got blank reactions. Anxiety got a few laughs, but there were positive responses towards Annie and Alvy and Annie Hall. So Annie Hall it was. 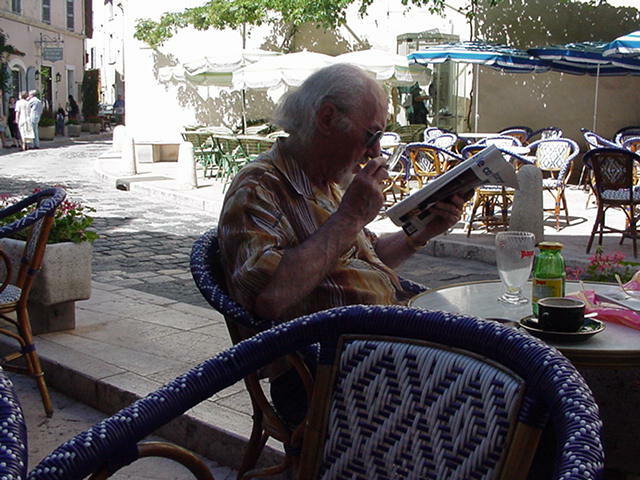 Allen, who is now starring in commercials for the French Tourist and Visitors Bureau, might have called it The Amusing Stranger With Anhedonia, or What Camus Would Have Written If He Had a Sense of Humor. The two works are about the same thing. 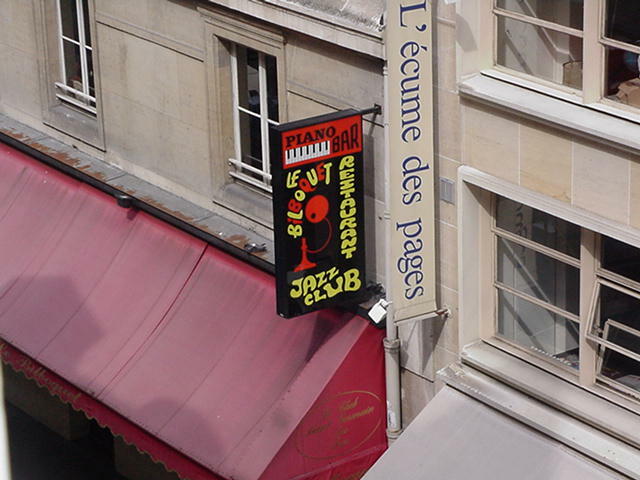 Funny thing, when I'm in Paris I usually stay at the Madison, where Camus wrote that very novel. His favorite hotel. Just down the street from where he died when, in 1957, his car hit a pole. Spooky. Perhaps next trip I should try another hotel? 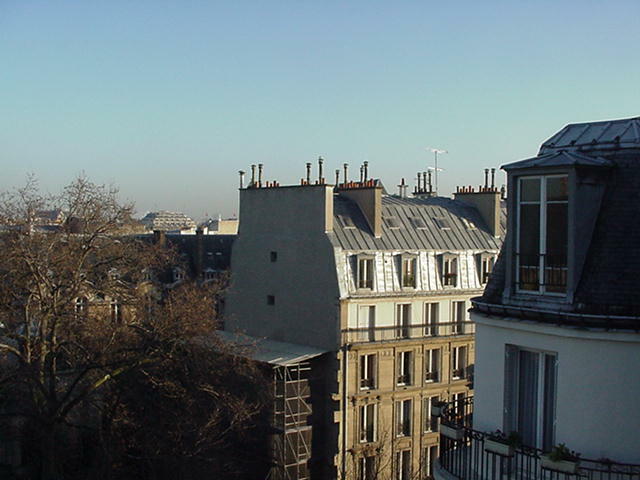 L'Hôtel down on rue Bonaparte, room 16, where Oscar Wilde died? No. Bad idea. Quite morbid too. And I probably should not revisit Lourmarin in Provence, a pretty little village a bit east of Avignon where Camus is buried. Perhaps I should vacation in Iowa from now on. Nothing ever happens there. And any emotional affect is fine. Photo references -- click on the image to enlarge it. While we all wait for my friend Joy to submit her first film review, just a note on the most recent silly Hollywood news. A few weeks ago I explained how one get one's star in the embedded in the sidewalk in the middle of Hollywood. One's agent or studio pays for it. But there is a nominal approval by the Hollywood Chamber of Commerce, and they've just announced who comes next. Britney Spears, Kevin Costner and Halle Berry are getting stars on Hollywood's Walk of Fame. Fine. A mile west of me is what we locals call the "Halle Berry Memorial Intersection" - Sunset and Doheny. This is where, a few years ago, Berry ran the light in her massive SUV and totaled a little Pontiac Sunbird. Then she drove off with stopping at all. The folks in the smaller vehicle were pretty banged up. The police caught up with Berry a few days later. She apologized, paid some big damages, and was given a warning. Star power. Glenn Close, Anthony Hopkins, John Singleton, Ted Turner, the band Journey and the seventeen-year-old twins Mary-Kate and Ashley Olsen will also get the sidewalk honor next year. The new "inductees" were announced last week by Johnny Grant, chairman of the Hollywood Chamber of Commerce. Johnny Grant must be nearly ninety by now, the last of the folks from the glamour days, when Hedda Hopper was writing things about Gary Cooper, Jimmy Cagney and Humphrey Bogart. That was back when F. Scott Fitzgerald and William Faulkner would meet for drinks at Musso and Franks and discuss screenplays they were working on - back when one afternoon they discussed which Hemingway story just couldn't be made into a coherent movie. They agreed it was To Have and Have Not. Seems Faulkner sobered up and pulled it off. The subsequent movie was Lauren Bacall's screen debut, and that was Hoagy Carmichael on the piano and singing. But those days are long gone. Ted Turner and the Olsen twins? This somewhat proves that the standards now are... vague? So get an agent and you too can become immortal, in a sidewalk sense only. "There's a favorite on this list for everybody. We have both young and veteran performers and local, national and international stars," Grant said. "The induction ceremonies will generate a lot of excitement for our residents and visitors from around the world." Indeed. Fame out here is an odd thing. Tonight I'm having dinner with friends at Musso and Franks. I'll raise a glass to Fitzgerald and Faulkner. But that movie, To Have and Have Not, wasn't really that coherent. In the the last issue of Just Above Sunset there was a review of the "Gotan Project" and one of their trance-electro-tango albums which I've been playing here for the last year - see June 8, 2003 Reviews on lower right of the page. The "Gotan Project" is mentioned again (June 19) in MetropoleParis, Ric Erickson's site. You'll find the link to MetropoleParis on the home page Just Above Sunset Archives, lower right. These cooler-than-hip "Gotan" fellows are getting entirely too much press. Go buy the album. You too can be plugged in. Ric also mentions Les Négresses Vertes and I recommend same. Diana Krall seems to puzzle him. She appeared twice in Paris last year. But she is not a nice lady, even if a jazz singer of some talent, from Vancouver of all places. I caught her live at UCLA a few years ago. A sneering, arrogant prima donna - with a great voice and good piano chops. I grew up on Duke Ellington music, and still have all the vinyl LP albums that were released in North America, and somewhere or other have a whole bunch of 78's from long ago. The Saint Germain des Prés Jazz Festival five weeks ago in Paris (L'Esprit Jazz à Saint-Germain-des-Prés) dedicated a great deal of stage time to Duke Ellington. I missed it of course. Drat. I have been listening to some modern versions of Ellington classics and recommend Ellis Marsalis' 1999 album Duke in Blue (Columbia 63631) as the best of the lot. It's all solo piano. His extended version of Sophisticated Lady is amazing. And from experience I know those are hard changes. This is quiet music for the evening. This last week Turner Classic Movies has been showing a movie with an Ellington score, Paris Blues. And HBO has been screening Anatomy of Murder, an Otto Preminger film with a great Ellington score. Too bad each film is so dated. Of the two you might want to catch Paris Blues (1961). In Paris Blues, Ram Bowen (Paul Newman) and Eddie Cook (Sidney Poitier) are two expatriate jazz musicians living in Paris. Yeah, yeah. Newman pretends to play trombone (you hear Juan Tizol) and Poitier pretends to play tenor (you hear Paul Gonsalves). Of course they meet and fall in love with two young American girls, Lillian and Connie, who are vacationing in France. This is Joanne Woodward and Diahann Carroll. The conflict? The guys must decide whether they should move back to America with them, or stay in Paris for the freedom it allows them. Martin Ritt directed this mess. But the music is good. And it was filmed on location in Paris, with the club scenes at Le Bilboquet. I've been there a few times. And heck, Louis Armstrong is in the film too. And Paul Newman learned to play the trombone well enough that he could play in public a bit, in preparation for the role. I saw the film when it came out. I was fourteen. I bought the LP of course. This perhaps is why I like Paris so much. Below is how Le Biloboquet looked in June, 2000 - click on the image to enlarge it. Where I had my birthday dinner that year. Heard a young French bop pianist really go to town on Joy Spring and some other tunes.